This highly compact mini-PC is really smartly designed, save for a couple of niggles, and is great for home entertainment duties, plus it offers some useful additional features. 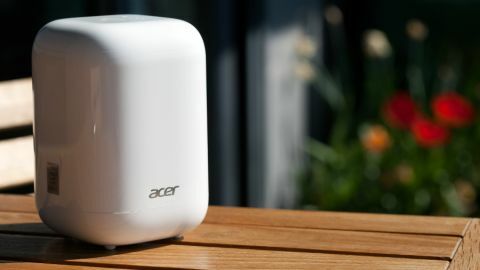 The Revo One RL85, Acer's entry to the ultra-mini PC market, has Apple's Mac mini and Intel's NUC micro-computers in its sights. Like the former, this unit comes with everything included, packing room for three RAID-ready SSDs in its tall tic-tac white shell – and like the latter, this is easily upgradable and techie-friendly. Acer's marketing has focused on the Revo as a home media centre, with its 7.1 HD sound coming through the HDMI port and its dual-4K support – but those same qualities would make it work well as a funky office computer. Given that tiny form factor – just over four inches across each way – Acer has skipped on fancy graphics tech completely, opting for Intel integrated graphics across all models. Despite that, the device claims to handle two 4K screens easily – just not anything that requires graphical oomph. The photos don't lie – this is a singularly handsome little device, an escapee from the ethereal science-fiction school of design. The only element to break that smooth white design is the Intel Inside sticker on the side. It's a nice weight in the hand and the four small feet on its bottom let the Revo sit reliably on most surfaces – though they also increase its chance of tipping substantially. On the rear of the device sits an array of ports. There are two low-speed USB 2.0 ports, a Gigabit Ethernet port, then two USB 3.0 sockets. Finally, there's an HDMI, a mini-DisplayPort, a Kensington Lock and a 3.5mm audio jack. On top of the Revo, carefully concealed are four status LEDs that glimmer subtly through the translucent surface, and an SD card slot. And it has solid, fast 802.11n Wi-Fi. This all compares favourably with the Mac Mini, which has a similar number of inputs – albeit with two proprietary Thunderbolt ports as well. Getting inside the Revo is more of a struggle, given that the package we received had absolutely minimal documentation. There's a quick start guide which lets you see how everything connects up and how to install SDDs, a warranty and… that's it. It turns out that you need to push a small button on the rear between the power button and power input socket, whilst simultaneously pulling up. It took several attempts for us to do this, and it's not initially clear how it connects together, making it difficult to know how hard you have to pull without breaking the thing. The design of the two quick-release caddies, in contrast, is extremely well done. The SSDs sit in them squarely and they're removed simply by being pulled upwards. To replace them, you simply angle the caddy so its nubs line up with the Revo and slide it in, so the connector clicks together. The third disk is buried away between them, and requires a screwdriver to get at – which also gives you access to the RAM slot and the 802.11n wireless card. The Revo comes with a wireless remote control which doubles as a keyboard. Though it's packed full of functions, it's more about packing buttons in than showing off stellar design – it doesn't match the style of the main casing in any way. On one side it's got a power button (which didn't seem to work for us), a too-sensitive touch pad (which needs activating by clicking the 'cursor' button on the unit's side), a microphone button (which didn't seem to do anything) and an array of standard Windows buttons, as well as media control buttons. On the rear, it has a 56-key keyboard, with a function key to access many of the punctuation keys. It's rather annoying to flip over the unit to use this keyboard. The function and shift keys need to be held down rather than toggled, which makes pressing any buttons near them rather difficult, as both your hands will need to be in the same area. Fat fingers beware! The controller doesn't work until the computer's already set up and everything's installed so you will need a keyboard and mouse to get your unit working. Indeed, given the controller's shortcomings, a wireless keyboard and mouse would not be a terrible idea. Moreover, as it needs a separate wireless dongle to work, you'll be left with just one USB slot if you plug this and a keyboard and mouse in. Alternatively, you could download Acer Revo Suite for your smartphone. It installs swiftly from iTunes or Play (we tested on Android) and has a fast, easy and automatic Bluetooth connection. It's actually easier to use as a controller and keyboard, and more accurate than the supplied controller on big screens.